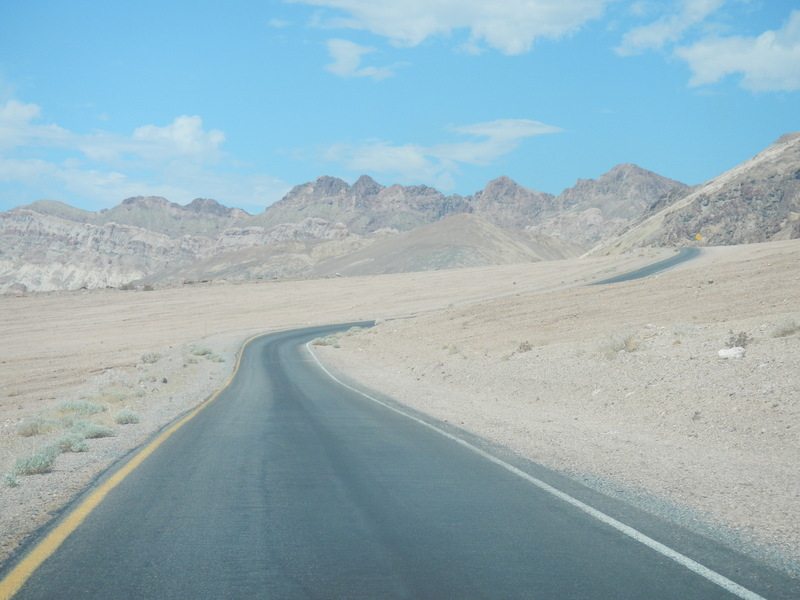 It only takes about two hours to get from the hotels on the Las Vegas Strip to Death Valley National Park, a short and easy day trip from the craziness of Sin City. I stood atop Dante’s View with my friend, happy to have made the drive. We got a deal on a car rental for the weekend and wanted to make the most of it, so we took the drive west into California. Looking out on one of the most magnificent panoramas I have ever seen, in the largest national park in the continental United States, I was happy to have woken up early and made the drive. We were staying at the Venetian Resort and Casino while we were in town for the University of Minnesota football game. But since we had the rental car, which we had used to get to the game, we wanted to make the most of it and get out and see some other sites. For months we had talked about going on a hike in Zion National Park, or hitting up some museum off the Strip, but in the end decided on heading out to Death Valley. Driving down into the valley from more than a mile above sea level at Dante’s View, the thermometer on the car steadily rose from the mild 79 degrees we experienced at the top. By the time we reached the visitor center at Furnace Creek, which sits 190 feet below sea level, we were well over 100 degrees. It would be no problem, though; we’d slather on some sunscreen, buy plenty of water in the gift shop, and head out for a short walk to see the Natural Bridge. It was only two miles round trip. No big deal. The full force of the heat punched me square in the face when I walked out of the gift shop, though, while my friend finished up his souvenir business inside. I knew at that moment that there was no way we were making the hike. It was way too hot out, and thus quite dangerous. He agreed, but I think still held a little hope that we would change our minds when we approached the parking lot. On our way we stopped off to do the scenic drive through the Artist’s Palette. It is only a few miles south of Furnace Creek and easy to get to. 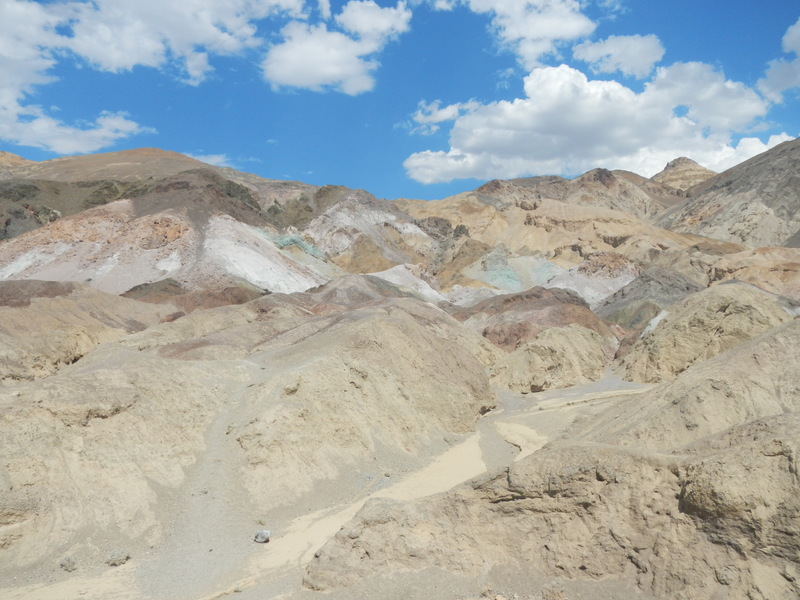 I had been there before, loved it, and wanted to show it off to him, the beautifully colored collection of hills in the park that are all painted different colors due to the oxidation of the rocks. We stopped, snapped a few photos, but it was too hot out to linger; even with the car’s air conditioner on high we could still feel the heat radiating in from outside. We continued south into the park. “There’s the Natural Bridge,” I pointed out. “Up there about a mile. You can’t see it from here, but it’s a cool site after an easy hike.” Just not in this heat. The closer we drove to Badwater Basin, the lowest point in North America and the sixth lowest in the world, the thermometer continued to climb. 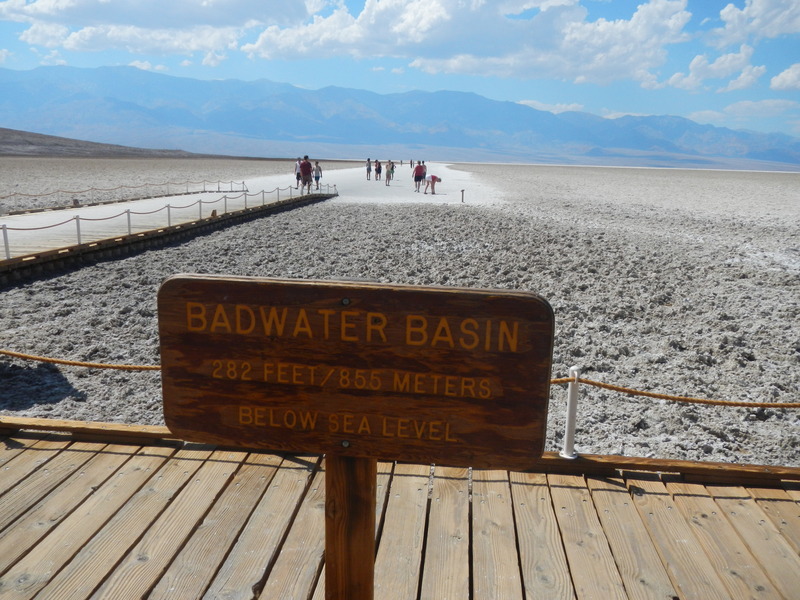 By the time we reached the Badwater Basin parking lot, 282 feet below sea level, the gauge read 111 degrees. I sucked for air as I threw open the door, not having made the long drive not to get out and snap a few photos. The heat was unbearable, though. I didn’t want to linger any longer than necessary, so I was quite pleased when I saw my friend turnaround from his walk out onto the salt flats. It was much too hot to stand long on the burning earth, and dangerously so without a lot of water. At Badwater Basin we were already toward the southern end of the park, so we decided to continue south and go back to Las Vegas. But no, a gate was closed and access denied. So we had to return north and exit on the same road we entered, State Highway 190. We skipped the rest of the park, due to the lack of time; I had seen it, all wonderful bits and stops, and my friend promised he’d return with his family when his kids were a little older. I understand the attraction to return. I have been wanting to make the drive to Death Valley from Las Vegas for years. It is one of my favorite U.S. National Parks, always pulling at my thoughts whenever I travel to Las Vegas. But we were there to see Sin City, so we turned east and headed back to town through Pahrump, passing scenic Red Rock Canyon, a stop on my next Vegas getaway, as we pulled into town for another night of debauchery, something that will only be remembered in Las Vegas. Stunning! I visit family in Nevada regularly, but haven’t yet made it to the Death Valley. Looks breathtaking. 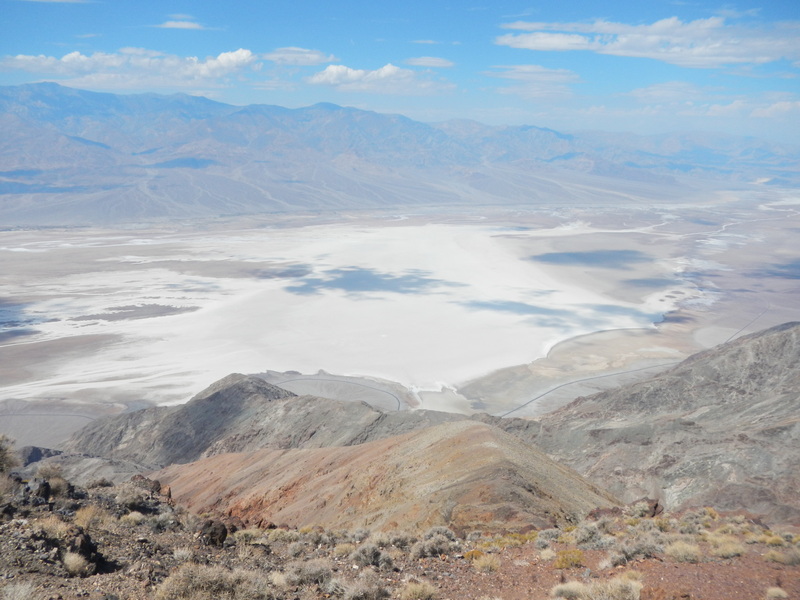 It’s definitely one of my favorite national parks, from all angles – up at Dante’s and down below at Badwater – and recommend it, and the area, as a great getaway during your visit. Thank you! I will definitely check it all out next time. I’ve always wanted to do the Vegas/Death Valley combo trip- thanks for sharing! Oh dear Jason! This landscape just took my breath away. This National Park is magnificent. Seen many photos of National Parks in North America, but this is so different, unique and wild. Death Valley really is awesome. I’ve been there twice, the previous time in March. I highly recommend it then, since it’s MUCH cooler and some snow-capped mountains make it much more picturesque.